Elegant, yet easy to make, these rich confections made with cream cheese, icing sugar, melted chocolate and vanilla, are rolled in coconut. Beat cream cheese in large bowl with mixer until creamy. Gradually beat in sugar until well blended. Add chocolate and vanilla; mix well. Shape into 84 (3/4-inch) balls. Roll, 1 at a time, in coconut until evenly coated. 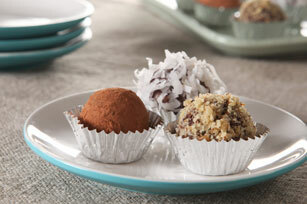 Try rolling the truffles in unsweetened cocoa powder, ground nuts or additional icing sugar instead of the coconut. As an option when serving adults, prepare recipe as directed except omit vanilla. Divide truffle mixture into thirds. Add 1 Tbsp. liqueur (almond-, coffee- or orange-flavoured) to each third; mix well. Shape into balls and continue as directed.